THANK YOU TO ALL OUR SPONSORS. 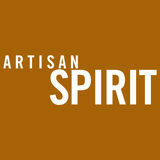 Our mission at Artisan Spirit Magazine is to share and celebrate the art and science of artisan craft distilling. We are humbled by the support of our sponsors. With their help, we can further our common goals of supporting creativity, innovation, and integrity within the industry we all love so much. BSG is focused on supplying craft distillers with the best ingredients from around the world. The craft distilling market trusts BSG to deliver the finest ingredients at competitive prices, without sacrificing customer service. With distilling malts and grains from Rahr Malting Co., Weyermann®, Simpsons, Crisp and Malting Company of Ireland, as well as a full range of yeasts, yeast nutrients, enzymes, botanicals, and finishing products, we have a wide range of distilling ingredients to help you create high quality, artisanal spirits. 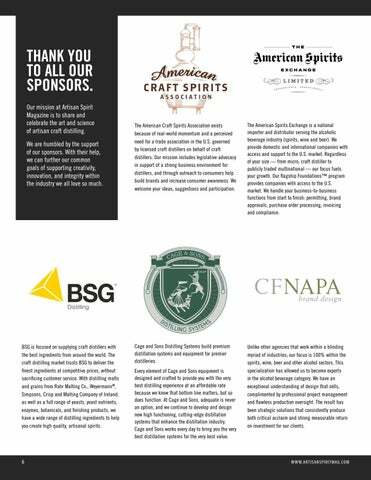 The American Craft Spirits Association exists because of real-world momentum and a perceived need for a trade association in the U.S. governed by licensed craft distillers on behalf of craft distillers. Our mission includes legislative advocacy in support of a strong business environment for distillers, and through outreach to consumers help build brands and increase consumer awareness. We welcome your ideas, suggestions and participation. The American Spirits Exchange is a national importer and distributor serving the alcoholic beverage industry (spirits, wine and beer). We provide domestic and international companies with access and support to the U.S. market. Regardless of your size — from micro, craft distiller to publicly traded multinational — our focus fuels your growth. Our flagship Foundations™ program provides companies with access to the U.S. market. We handle your business-to-business functions from start to finish: permitting, brand approvals, purchase order processing, invoicing and compliance. Cage and Sons Distilling Systems build premium distillation systems and equipment for premier distilleries. Unlike other agencies that work within a blinding myriad of industries; our focus is 100% within the spirits, wine, beer and other alcohol sectors. This specialization has allowed us to become experts in the alcohol beverage category. We have an exceptional understanding of design that sells, complimented by professional project management and flawless production oversight. The result has been strategic solutions that consistently produce both critical acclaim and strong measurable return on investment for our clients. Every element of Cage and Sons equipment is designed and crafted to provide you with the very best distilling experience at an affordable rate because we know that bottom line matters, but so does function. At Cage and Sons, adequate is never an option, and we continue to develop and design new high functioning, cutting-edge distillation systems that enhance the distillation industry. Cage and Sons works every day to bring you the very best distillation systems for the very best value.